Trust is dead. Now what? If you’re trying to sell something—whether it ’s a product, a service, or an idea—you are facing a new era of consumers who listen less and question more. Armed with more knowledge and jaded by a lifetime of unfulfilled promises, these consumers reject the traditional approach to sales and marketing. But what if you have something good to say and can’t get beyond this skepticism? To engage today’s consumer, a new language of trust is needed. 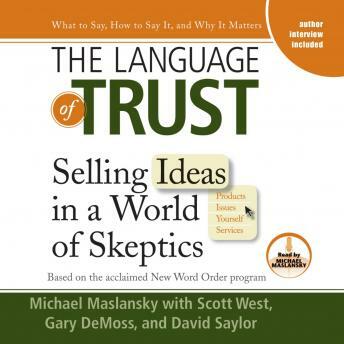 In this groundbreaking audio book, you’ll learn what words to use, what words to lose, and how to structure your message to overcome skepticism and build and keep the trust of your audience.